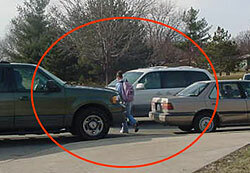 This study identifies transportation safety and operational issues at existing school sites in Iowa. The study team made site visits, collected data, and interviewed schools, law enforcement and traffic engineers. The study identified common problems and solutions to address these issues. This toolbox was written and designed for technical and non-technical users including traffic engineers, school officials, law enforcement, parents, teaching organizations, and others who are involved in managing traffic operations and safety around school zones. This research primarily focuses on the traffic safety and operation strategies for existing urban elementary and middle schools, but many of the solutions are appropriate for consideration in planning for high schools. Report Organization: The Toolbox to Address Safety and Operations on School Grounds and Public Streets Adjacent to Elementary and Middle Schools in Iowa was developed from the literature and observations, interviews and data collected from elementary and middle schools in Iowa. Each chapter of the toolbox is presented in a user friendly format that includes many photos to illustrate both problems and solutions to transportation safety and operation issues that exit at the schools in Iowa. The visuals within the handbook include photos and sample data forms that are useful for schools and traffic safety steering committees and traffic professionals. Important industry recognized documents are also be referenced throughout the chapters to ensure that the schools are aware of the guidelines and standards available. A glossary, index and references are also provided. 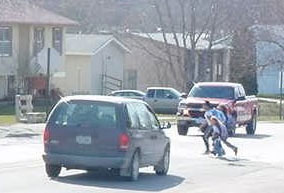 Kids dart across the street.